Hi, Free minor gutter repairs and why we started offering them to our customers. Although we feel we already offered a superior service we decided to give free minor repairs with every gutter clean. We done this as it must be frustrating to a customer to go through all the effort of booking in a clean waiting for the workers to show only to find out when they have left a drip or 2 is present still. Even if you point this out to most firms a further charge will be applicable usually between £10-£15 per repair. We will try to identify all drips on the day we always ask if customers have notice any too so we have a good idea of where to start. But this is where we truly excel and leave our competition behind, not only do we give a 6 month guarantee on blockages we also give a 6 month guarantee on leaks even if a new leak has materialised in that time. So to put that in to context for you the free minor repairs are fully guaranteed even though they have not cost you a single penny! Now before you start scratching your head and thinking what does a minor repair cover me for we have made a list so it crystal clear. We will seal all leaks where possible with a high quality sealant that even seals in the rain, handy in our line of business i can assure you. 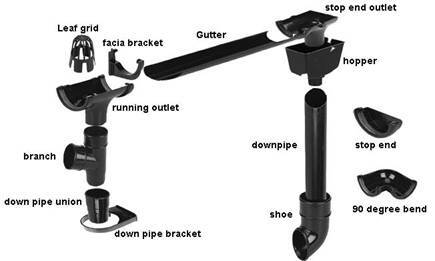 If you have black plastic guttering which 9/10 households do, we can replace any corner, joiners, outlets, end caps, downpipe brackets and even fascia brackets if it does not require taking the full length of gutter down. The list we cover here will fix most problems for our customers, unfortunately sometimes the repairs may be more in depth. This is usually where the guttering has been installed to a poor standard and the alignment is incorrect, this means the water is collecting and not draining off to the downpipe as it should be. In order to correct this we would need to take down the existing guttering and adjust the fascia brackets accordingly. We will align 1 or 2 fascia brackets where possible free of charge. also another not so common issue is the guttering has been installed to low on the fascia wood and the rain water simply is not making it to the guttering, instead it is running behind and damaging the fascia wood. If either of this 2 problems are present we will offer you a free no obligation quote to carry out the work. We hope this has helped our customers better understand what free minor repairs entails. Thanks for reading from the London gutter clean team!